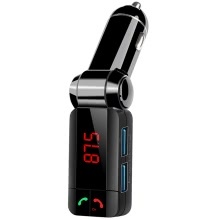 This is a special Bluetooth car charger MP3 player for vehicles. It can transmit music files inside the USB disk to car stereo wirelessly, and switch an incoming call to the hands-free state as long as your mobile phone is provided with the Bluetooth function. When the call is finished, it will be switched to play music automatically. And it supports two-way USB plug, car battery voltage display and load current display. Support car battery voltage display and load current display. Any angle adjustable; applicable for all types of vehicles. FM transmitter can transmit music files to car stereo wirelessly. LED display window can show the information clearly. Support LINE audio input and audio output. Support playing music by USB disk. Support answer, hang up, reject and redial via Bluetooth. Support Bluetooth stereo music to play. Adopt Call Echo Cancellation and Noise Reduction (CVC) technology. Dual USB output voltage, providing powers to other devices which is up to 5V/2.1A. Support USB charging intelligent recognition.